Norwich went into this game knowing that Scunthorpe could be more fired up than they have been most of the season, as they have just acquired a new manager and are desperate to move of the bottom of the table, but this game only ever had one outcome possible! New Norwich loanee Dani Pacheco was handed his first start, whilst Scunthorpe made 4 changes to the squad that beat Ipswich last week, with their new boy Ramon Nunez getting his debut. City started the match sharply, with Marc Tierney slicing his shot onto the roof of the net, followed by Andrew Crofts effort which failed to trouble Joe Murphy in the Scunthorpe goal. Norwich held onto possession for most of the opening minutes and it only took 10 minutes for Canary Captain, Grant Holt, to put away his first. Dani Pacheco was proving impossible to handle by Scunthorpe as he skinned his marker, but could only drag his shot wide of the post. Iron loanee Nunez then showed a bit of flair with a 25 yard curling effort which deflected just over the crossbar, and from the angle I was sat I thought it went in! Norwich then continued to pile on the pressure, first with Andrew Surman shooting just wide, then Hoolahan, who was lively throughout the match before picking up a knock, had a decent low effort on goal that had Murphy worried. The pressure paid off on the 30 minutes when Holt turned his defender well in the box only to be brought down to the ground, resulting in a straight red for Reid and a penalty for Norwich. Holt stepped up to claim his 50th goal for the boys in yellow. Scunthorpe then surrendered their attacking option in Nunez for Sam Togwell to tighten up their defence, but Norwich were in no mood to be stopped with David Fox, Hoolahan and Holt all coming close to adding another to the tally. The second half started quietly, but sprung back into life when Hoolahan rattled the bar with a superb strike. 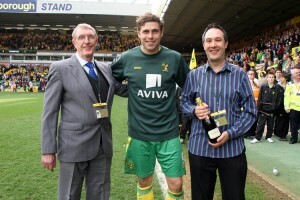 However, Grant Holt was on fire and owned the afternoon sealing his hat-trick moments later. Croft’s cross from the right was nodded down into the bottom corner from Holt to take his season tally up to 21. With the game won Norwich manager Paul Lambert then took off Hoolahan, who seemed to take a knock seconds before his departure, and Grant Holt to a standing ovation from the crowd. This did not hinder the Canaries though as Tierney forced a great save from Murphy from 12 yards out. Pacheco was also taken off later for Simeon Jackson who took his chance to shine well, scoring within 5 minutes of walking onto the pitch. He stole the ball from Michael Raynes and slipped the ball past Murphy for his first goal in 21 games! At 4-0 Norwich could have sat back, but they worked patiently to add more goals, again with Simeon Jackson who finished a near-post cross from Henri Lansbury who worked hard to get the ball there. Scunthorpe still had spirit left in them though in the 89th minute as Michael O’Connor spotted Ruddy off of his line, he went for the lob forcing Ruddy to tip the ball over the bar. The game wasn’t over there though, Jackson still had time to seal his hat-trick with another close-range finish. Overall it was a brilliant game, I can’t help but feel sorry for Scunthorpe and they are probably accepting the fate that they will be in League One next season.